Pours a medium caramel color full of carbonation, settling a slightly darker amber color with a good sized, off-white fizzy head that quickly diminishes, although the lacing does not as it does well to leave sticky rings around the glass. Aroma is at first of sweet cereal malts, like Fruity Pebbles, paired with an overpowering alcohol presence. Initial taste is massively sweet, almost like an artificial sweetener. It relaxes just a bit towards the finish, but its still incredibly sweet with a long duration. Provided that it's a double IPA, there is hardly any hop presence here, as the sweet malt notes completely dominate the mouth. 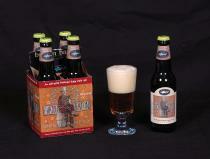 Light to medium-bodied, it has an oily mouthfeel with ever-so-gently carbonation.